Lugar: Boulogne sur Mer, Provincia de Buenos Aires, Argentina. 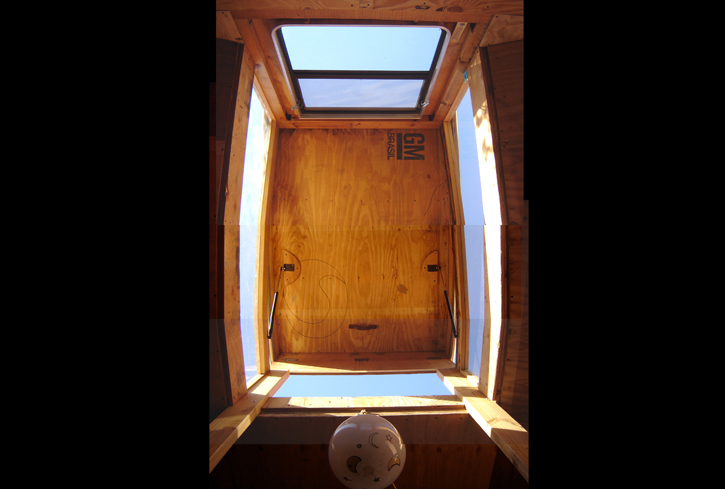 Obra nominada para el Premio Mies Emergente 2014 del IIT College of Architecture, USA. 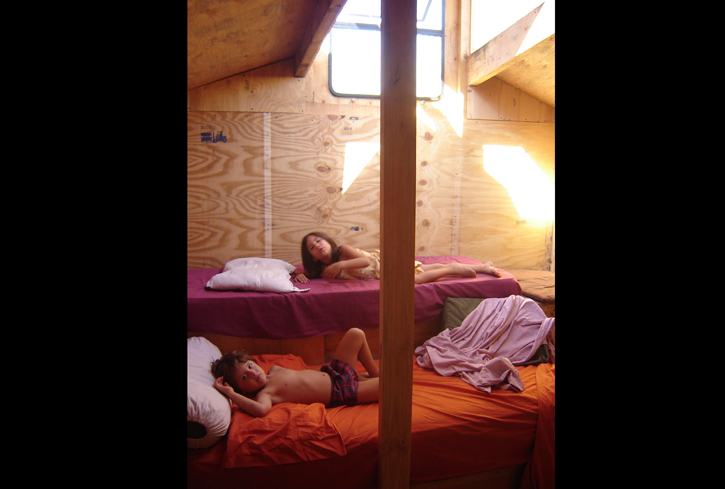 Esta mezcla de habitación, mirador, cabina de tren, barco, casamata es la ampliación de una vivienda alquilada para ser utilizada como dormitorio para Vera y Lucio, hijos de Sabina y Lucas, que crecieron y necesitaban más espacio. También bautizada como plug out unit #1, forma parte del catálogo plug and live system. En su interior, hay un escalonado para colocar los colchones de los niños, a modo de gradas sobre el cuarto-playroom. Por afuera el escalonado es una galería alta que permite una buena entrada de luz a la planta baja, donde hay un estudio de piano. En la cima, un lucernario-mirador para ver los astros desde las camas. 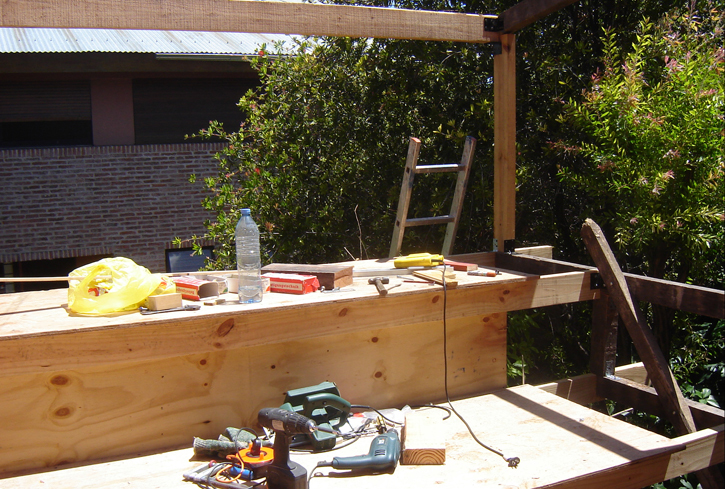 La ventana del frente del mirador es estándar de casa rodante. 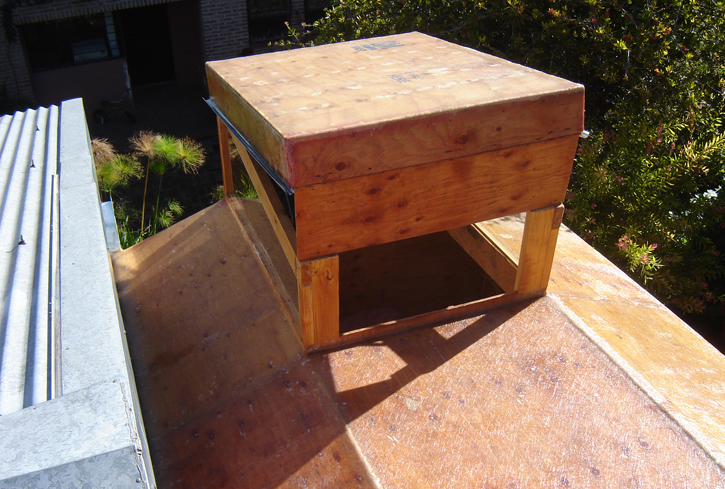 El techo del mirador se puede abrir, mediante dos elásticos telescópicos de aire comprimido de un baúl de auto, para poder ventilar y tener acceso a la cubierta. Construida con simples fenólicos de 8 y 15 mm. reutilizados de cajas de autopartes GM Brasil, viejos tirantes de demolición y algunos nuevos de pino de 2×5”. La técnica constructiva es la conocida american ballon frame, con aislamiento térmico en el interior de los paneles. Sus aristas están unidas con fibra de vidrio, (una técnica náutica) como también la unión a la mampostería. El techo también está terminado con fibra de vidrio para impermeabilizarlo por completo. Utilizamos herramientas simples: cierra circular, caladora, amoladora, taladro con y sin cable, tuercas, tornillos, pinceles, rodillos y nuestras manos. 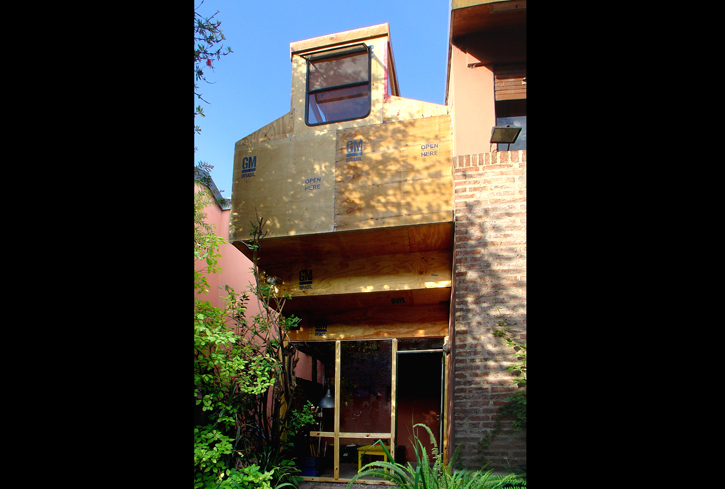 Esta cabina es desarmable y posible de reinstalar en otro destino para así restituir el estado original de la vivienda cuando finalice su contrato de locacion. El costo de los materiales fue aproximadamente de u$d1000. La superficie cubierta total es de 17.50 m2 y la duración de la obra fue de 10 días. 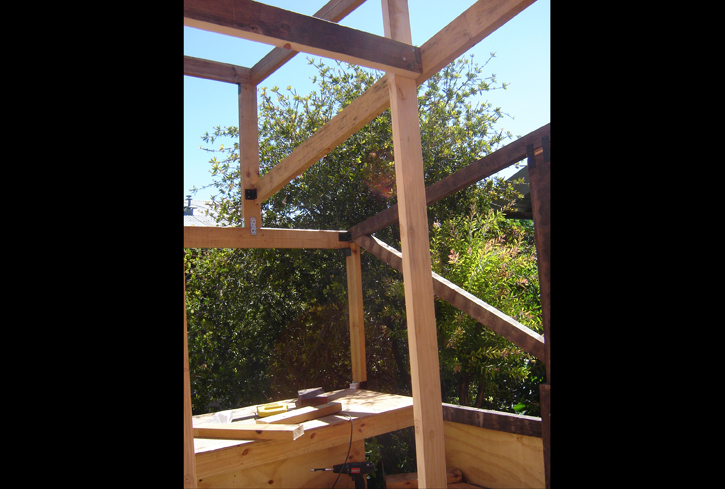 The cabin was built in order to fulfill a need for more space in a home. The family grows and the house adapts itself to the growth. 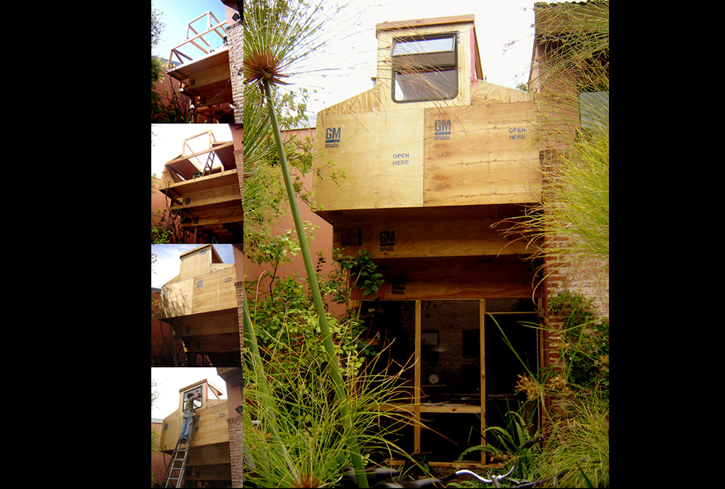 The house was rented and the owner accepted this construcction on the contidion that it be taken down once the lease ended.. 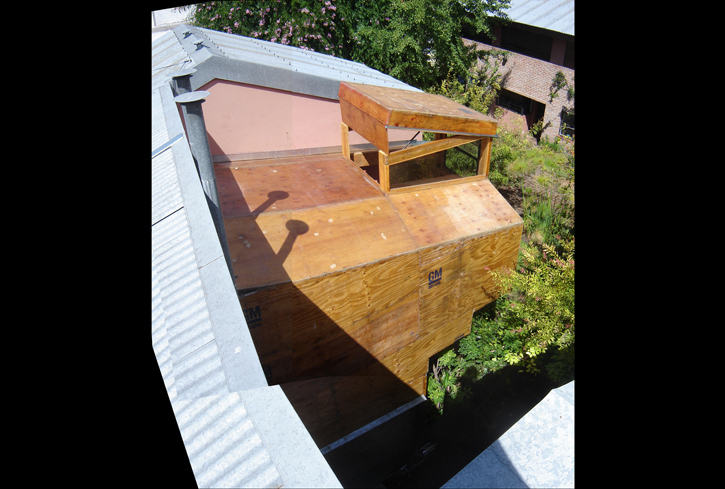 The piece added to the existing building was built usign recycled, salvaged elements and with a wooden framework mounted in only ten days. 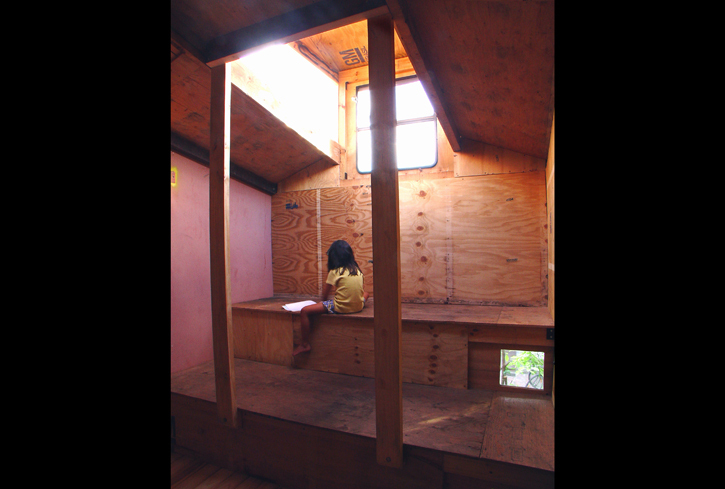 Its interior includes a tiered area for matresses for the children, like bleachers over the playroom. On the outside, the tiered area is a high gallery that lets the light into the lower floor, where a piano studio was set up. 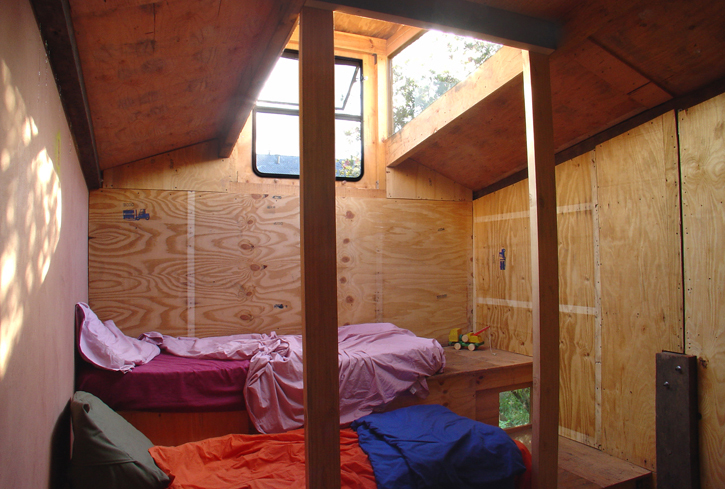 At the very top, a light tube lets the stars be seen from the beds. 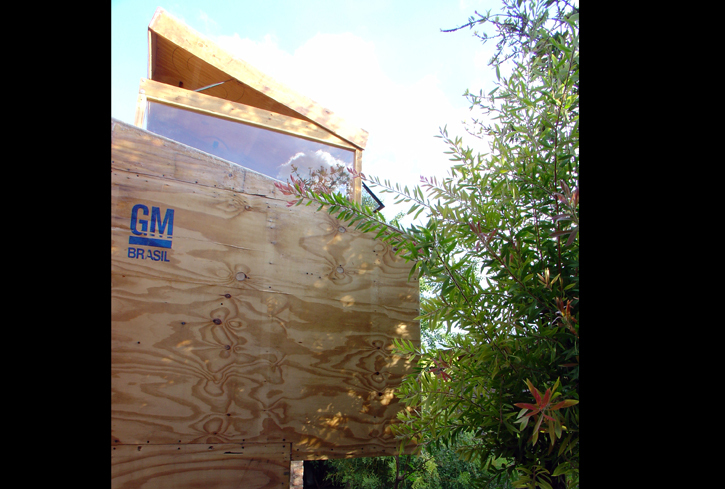 Built from reused 8 mm and 15 mm thick phenolic plywood panels from packing cases from GM automobile parts and from old wooden beams from demolished buildings, the cabin has been constructed by using the technique of the balloon frame, with heat insulation on the inside of the panels, and for the roof, fiberglass as exterior insulation and sealing. 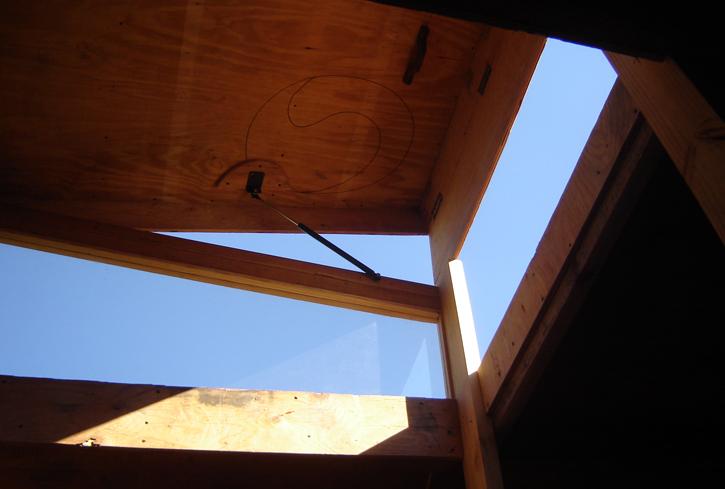 The window in the roof can be opened so as to be able to ventilate the house and to accede to the room through a set of telescoping arms salvaged from an old car. 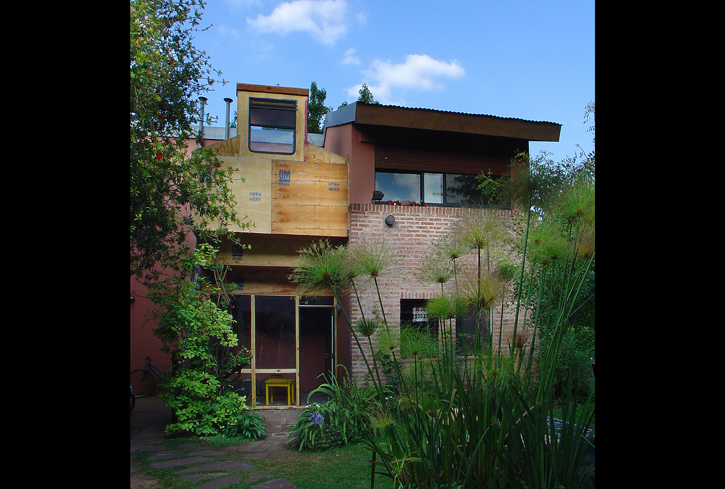 The Project consisted in adding an extension to a house in a residential area on the outskirts of Buenos Aires. This children’s cabin was built in a compund comprising five homes, with three at the back and two at the front. 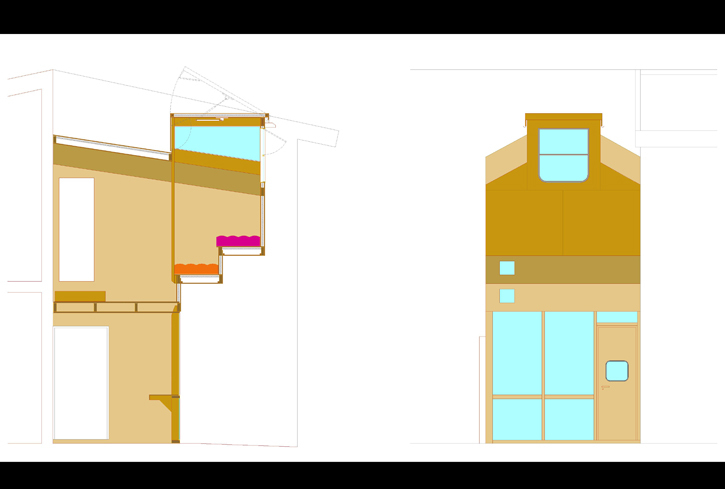 It occupies a space in the interior courtyard formed by the two semi-detached houses at the front. This courtyard was planned for further building for each of the houses. 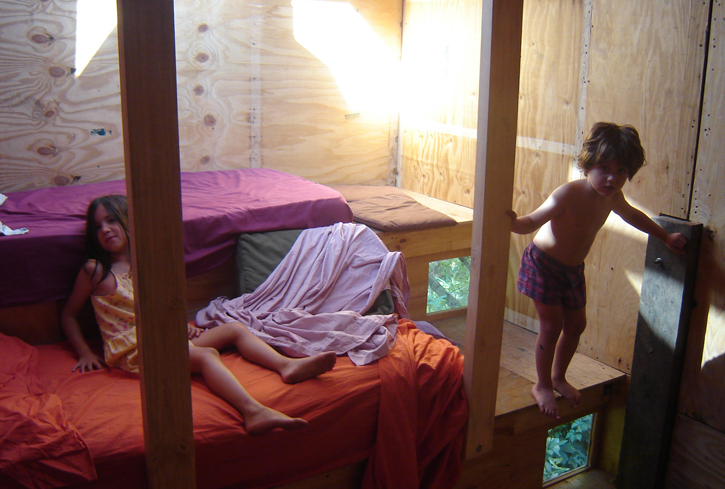 The cabin was very well received by the neighbors and was not only used as a bedroom; the children used it as a place for adventure, a shelter, a treehouse, a lookout point, a cockpit, a boat, a truck, a fun place to live and play and imagine. 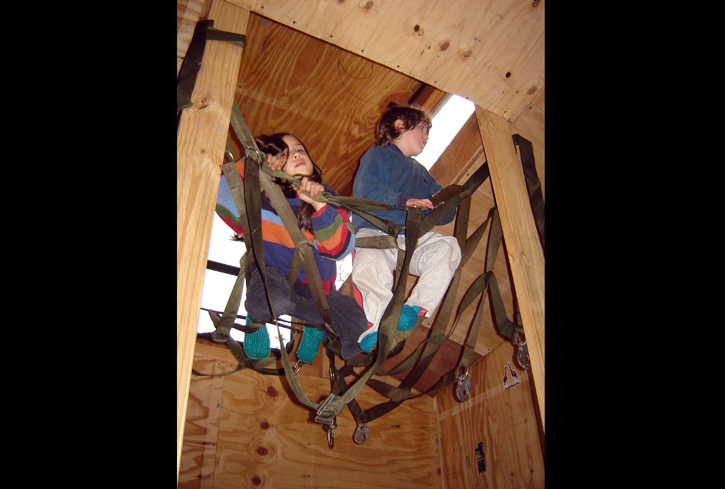 The children’s cabin was used for five years, afterwhich it was taken apart and stored as a kit, while the actual house was returned to its owner in the conditions stipulated in the lease.